Teijin Fibers Ltd. (now Teijin Frontier Co.), a leading manufacturer of polyester fibers in Japan, and Asahi Kasei Fibers Corporation announced on July 10, 2012, that they have begun recycling school gym uniforms in Kyoto municipal schools in cooperation with the city of Kyoto. This initiative is the first of its kind to recycle school gym uniforms into new polyester raw materials in cooperation with a local government. 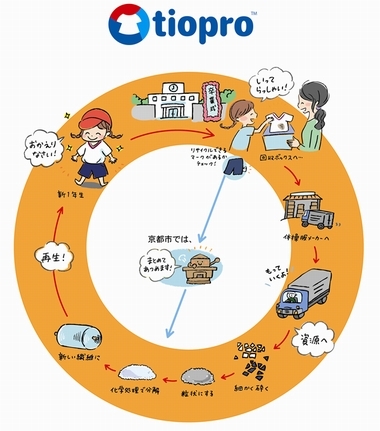 The companies plan to propose this local government-involved business model to other self-governing bodies with the goal of expanding the project to other parts of Japan. The two companies have been involved in a gym uniform recycling project called "Have a Nice Trip, Welcome Back!" targeting schools across Japan since 2008. The number of participating schools has increased every year. In the city of Kyoto, 24 municipal schools have participated in the project since fiscal year 2010. The project this year aims to further enrich environmental education for schoolchildren through the support of the city of Kyoto. The city promotes school gym uniforms that are eligible for recycling, undertakes the actual collection, and covers the costs of collecting and recycling the uniforms. Schools participating in the project use the gym uniforms produced from either of the two companies' recyclable polyester fibers and collect discarded uniforms after use. The collected uniforms are converted into new polyester raw materials with quality equivalent to that of those made from petroleum. Under this project, both energy consumption and carbon dioxide (CO2) emissions are reduced by about 80 percent, as compared to when raw materials are produced from petroleum.